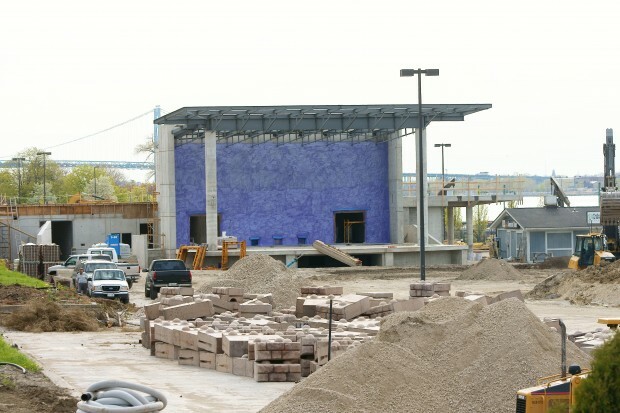 With the kick off to Windsor’s festival season three weeks away, we took a look at how construction is progressing along the riverfront. Construction of the new stage is moving along fast, with the roof being completed this week. Work continues along the sloped hill from Riverside Drive building it up to add in a sidewalk and new retaining walls. Several trees were cut down along the road edge opening up the view to the plaza and stage area. With a week of rain in the forecast, you can bet contractors and city crews will be working overtime to get this complete for Beaverfest which kicks off June 2nd.